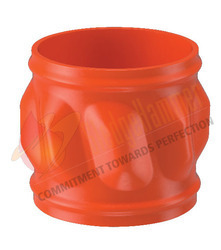 We manufacture Solid Rigid Centralizer which is fabricated from supreme quality material at affordable price to our customers. These centralizers are designed to minimize unwanted removal of well cake and for easy running of casing. These centralizers are well head friendly and have high impact with shock resistance, along with optimum tensile and yield strength. These are appreciated for their high quality and exclusive usage. The Centralizer is perfectly tested before they are dispatched. 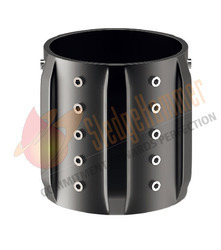 Sledge Hammer Stand of Band is designed to provide a positive stand off the casing for both cased and open holes. The angled fins provide increased turbulent flow. These Stand off Band is require where close tolerance between the casing and the hole is being encountered. Mainly it's designed for the liner applications.Design of the stand off Band allows for reciprocation and rotation during cementing and can be installed between Set Screw Stop Collar (SC04). These Stand Off Band undergo a special Phosphate coating process to prevent from Rust then coated with special Polyester Powder. These are available in all sizes ranging from 3 1/2" to 20". Any special sizes or combination can available on request. Backed by the deft experience and a competent team of diligent personnel, we are delivering a wide range of Bronze Alloy Spiral Vane Solid Rigid Centralizers. These rigid centralizers offered by us are known for catering to the requirements of better cementing in highly deviated and horizontal wells. Also, this range of rigid centralizers is available in different customized forms in accordance with the diverse requirements of esteemed customers. Our clients can avail a wide range of Aluminum Straight Vane Solid Rigid Centralizer (Fix). These products offered by us are utilized in different industries, owing to their durability, dimensional accuracy, superior performance and corrosion resistance. Along with this, the offered range is widely appreciated among the clients owing to its compact designs and light weight. This range of aluminum solid rigid centralizers is applicable in sugar, engineering, automobile and allied industries. We are offering a wide and supreme range of Aluminum Straight Vane Solid Rigid Centralizers. These aluminum straight vane solid rigid centralizers are offered in different customized specifications as per the diverse requirements of clients. This range is applicable in different sectors such as engineering, automobile, automotive and allied industries. Along with this, the offered range is applauded among the clients for its durability and high efficiency. SledgeHammer Oil Tools Pvt. Ltd is incorporated in the year 2006. Since our incorporation we are engaged in Manufacturing, Supplying, Exporting and Wholesaling a huge gamut of OilFieldAccessories to our clients across the globe. Our range of products includes Standard Straight Bow Centralizer, Rigid Bow Centralizer, Cementing Plugs & Float Equipments, Solid Rigid Centralizer, Stop Collars and Dopes and Compound. Our aim is to offer superior range of products to our clients with maximum satisfaction. These accessories are manufactured in our advanced manufacturing unit under the supervision of our experts. We also check the quality of these accessories on various parameters. We also have efficient transportation facility that allows us to meet the bulk demand of our clients within the committed time frame. The DAVO2 should be used in areas where a good primary cementing job is required, including deviated and horizontal wells, liner overlaps, and shoe joints. They are suitable for either cased or open hole. "DAV02" are made of high tensile, solid, cast aluminum, for shock, impact, and corrosion resistance. Sledge Hammer's Welded Spiral Vane Solid Rigid Centralizer Fixed is designed same as Welded Spiral Vane Solid Rigid Centralizer except rows of set screws on the outer periphery of centralizer to restrict rotation. It can be easily converted from fixed to non fixed design by detaching set screws and positioning with stop collars. All centralizers are stored painted or coated with polyester powder. These are available in all sizes ranging from 3 1/2" to 20". Any special sizes can be made available on request. We manufacture Steel Spiral Vane Solid Rigid Centralizer which is fabricated from supreme quality material at affordable price to our customers. This Centralizer provides easy operation without any defects. These are easily available in the market as per international quality standards. They are extensively used to examine, mining, digging and collective processing activities. They are available at cost effective price. These centralizers are in steel construction so as to provide superior toughness over other materials and alloys and are available in size. We fabricate ZincSpiralVaneSolidRigidCentralizerare designed from our experts and provides efficient functionality. These are checked on a regular basis and that are used in different industrial applications. The offered zinc spiral vane solid rigid centralizers are simple and convenient, extensively used for rough and fine polishing of metallurgical specimens. They are available at cost effective price. This gentle flow from the body to the height of the vane will eliminate scraping, gouging or digging into the formation and consequently reduce balling between the vanes. We have gained expertise in offering a wide range of Steel Twin Blade Rotating Centralizers. These steel twin blade rotating centralizers offered by us are appreciated among the clients for their high power saving capacity, steel construction, heavy duty, energy efficiency and durability. This range steel twin blade rotating centralizer is inspected on different parameters using stringent methods, so as to ensure its adherence with the highest quality standards and guidelines. We fabricate Zinc Spiral Vane Solid Rigid Centralizer are designed from our experts and provides efficient functionality. These are checked on a regular basis and that are used in different industrial applications. The offered zinc spiral vane solid rigid centralizers are simple and convenient, extensively used for rough and fine polishing of metallurgical specimens.They are available at cost effective price. This gentle flow from the body to the height of the vane will eliminate scraping, gouging or digging into the formation and consequently reduce balling between the vanes. 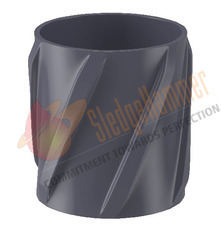 Sledge Hammer's Roller Centralizers are specially designed to run in inclined or horizontal section. 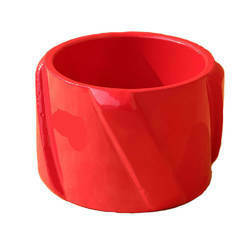 The rollers' envelope outside diameter is kept slightly larger than the centralizer fins' envelope outer diameter. The Rollers' envelope inside diameter is kept slightly larger than the fins' envelope inner diameter. When casing equipped with Roller Centralizer runs into the deviated or horizontal hole, the sliding friction between the casing and the borehole is converted into rolling friction. In case of irregular hole diameter, the borehole wall has an impact force on the spiral centralizer during running casings, the use of rollers reduce this impact. Torque reduction is provided by vertical alignment of rollers on the periphery of Roller Centralizer. 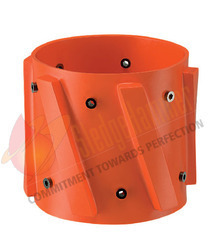 Sledge Hammer's Roller Centralizer is a complete mechanical friction-reduction solution designed for extended-reach wells. It reduces torque, drag, casing wear, tool-joint wear and differential sticking while also improving directional control, ROP and hole cleaning.n Low Drag Roller Centralizer, all rollers are arranged in horizontal direction.